I thought I was in for a whole day project when I set out to make Nick Malgieri’s Semolina Bread. The recipe calls for three two-hour proof periods, but with the East Coast heat and humidity, my kitchen is its own proof box. I had that loaf ready for the oven in under five! I made the dough in the food processor. So easy. I cut the salt by a quarter teaspoon, and added it to the dough after the rest period in the processor. Besides that and my shorter proof times, I followed the recipe as-is. I wanted my loaf to be like bread from the Italian bakeries over in Carroll Gardens, so I spritzed it with a little water and sprinkled on some sesame seeds before I put it in the oven. Then they all more of less fell off when I cut into it, but whatever. I had a crusty, golden loaf of bread, and it was delicious. My favorite part of a crusty loaf like this is the end bit. Actually my favorite parts, since there are two end bits! Slathered with a little salty butter, they are my ideal baker’s treat. For the recipe, see Baking with Julia by Dorie Greenspan or read Renee’s The Way to my Family’s Heart and Anna’s Keep it Luce. Don’t forget to check out the rest of the TWD Blogroll! Yum.. 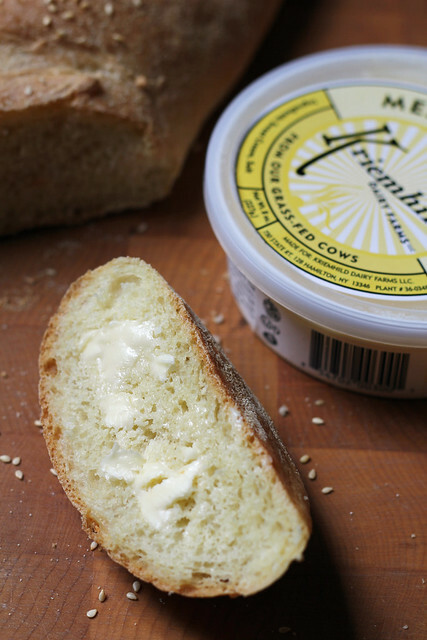 Nothing better than freshly baked bread with some salted butter! 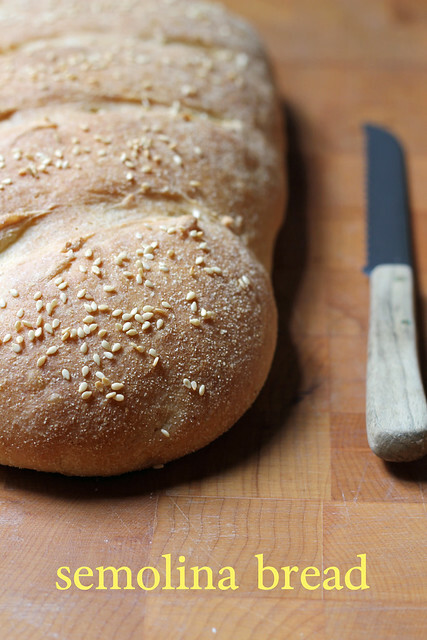 Lovely bread – especially with the melty butter all over it. Yum. Beautiful pics and a great loaf! I too like the end parts, here we call them `the elbows´. Perfect with butter! Gotta have that butter! Your bread looks tasty! I too enjoy the ‘end parts’! This was a winner at our home, I will make it again soon. The bread looks amazing! And I love the end too, preferably topped with Irish butter (never fails to make me swoon). You should try egg white mixed with a little water for the sesame seeds. I use it all the time for my sandwich loaf (the honey oatmeal one from King Arthur flour) and they never fail to stick! I will try that– thanks for the tip!! Nice loaf! The ends are my hubby’s favorite – I prefer the middle. Salted butter on warm bread is heavenly. I only have unsalted in the house, but when we go out it is oh so good. Lovely loaf! Definitely a repeat here. I like the ends too. Just out of the oven. Slathered with Butter. Baker’s treat is right!! Semolina bread is amazing, i also prefer semolina rasta as well. It’s so much tastier and light. You should try it!